Baron Giesl von Gieslingen, Austro-Hungarian Representative in Belgrade, to Laza Pacu, The representative of President of the Ministry and Minister of Foreign Affairs. In Belgrade 10/23 of july, 1914. 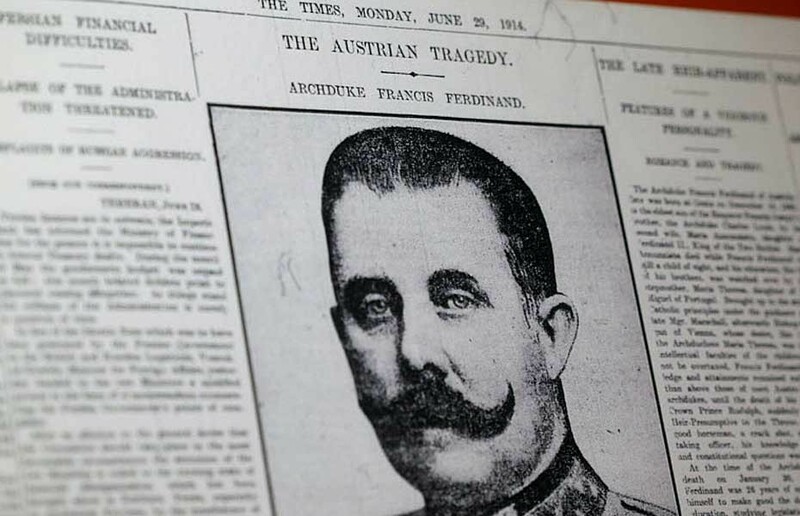 “The Royal Serbian Government condemns the propaganda directed against Austria-Hungary, that is to say, the whole body of the efforts whose ultimate object it is to separate from the Austro- Hungarian Monarchy territories that belong to it, and it most sincerely regrets the dreadful consequences of these criminal transactions. 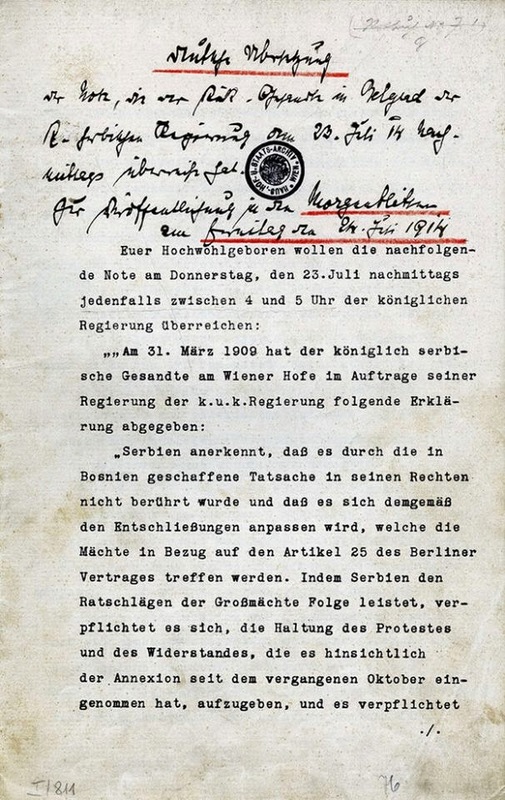 “The Royal Serbian Government regrets that Serbian officers and officials should have taken part in the above-mentioned propaganda and thus have endangered the friendly and neighborly relations, to the cultivation of which the Royal Government had most solemnly pledged itself by its declarations of March 31, 1909. 2. The six bombs and four Browning pistols along with ammunition — used as tools by the criminals — were procured and given to Princip, Cabrinovic and Grabesch in Belgrade by a certain Milan Ciganovic and Major Voija Takosic. 5. 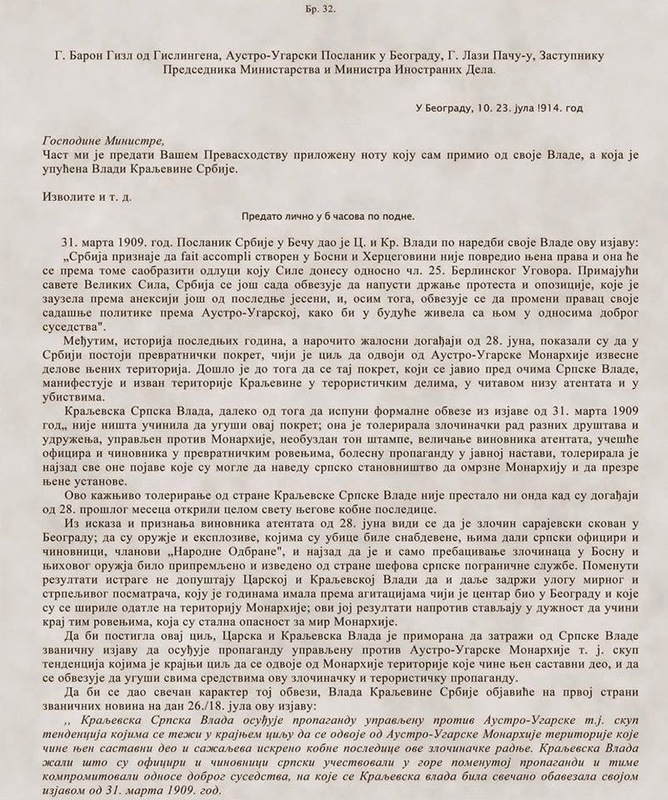 To make possible Princip, Cabrinovic und Grabesch’s passage across the Bosnia-Herzegovina border and the smuggling of their weapons, an entire secretive transportation system was organized by Ciganovic. The entry of the criminals and their weapons into Bosnia and Herzegovina was carried out by the main border officials of Shabatz (Rade Popovic) and Losnitza as well as by the customs agent Budivoj Grbic of Losnitza, with the complicity of several others. On the occasion of handing over this note, would Your Excellency please also add orally that — in the event that no unconditionally positive answer of the Royal government might be received in the meantime — after the course of the 48-hour deadline referred to in this note, as measured from the day and hour of your announcing it, you are commissioned to leave the I. and R. Embassy of Belgrade together with your personnel.